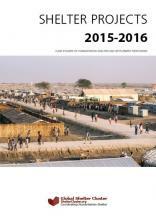 Spanning humanitarian responses from all over the world, Shelter Projects 2015-2016 is the sixth in a series of compilations of shelter case studies, overviews of emergencies and opinion pieces. The projects represent responses to conflict, natural disasters and complex or multiple crises, demonstrating some of the implementation and response options available. The book is intended to support learning by highlighting the strengths, weaknesses and some of the lessons that can be learned from different projects, which try to maximize emergency funds to safeguard the health, security and dignity of affected people, whilst – wherever possible – supporting longer-term shelter needs and sustainable recovery. The target audience is humanitarian managers and shelter programme staff from local, national and international organizations at all levels of experience. Shelter Projects is also a useful resource for advocacy purposes, showcasing the work done by the sector, as well as for research and capacity-building activities.